Customise Your Dosas & More At This Popular South Indian Joint Now at Bessy! Simple! This is precisely what iD is. Being a vegetarian restaurant and catering to movie-goers at Sathyam, iD scored with their ambience and tasty food. Now in Besant Nagar, they stick to the same mantra and we love it! What was it that really impressed us during the occasional meal before or after watching a film at Sathyam Cinemas at Idly Dosa (iD)? It was simple yet elegant and provided the perfect dining experiece. Today, iD has become one of Chennai’s hottest vegetarian chains and its fresh and contemporary take on the South Indian cuisine has impressed many! With a slightly bigger menu than the other joints, the iD at Besant Nagar offers all your favourite dosa varieties right from the ghee roast to the roasted garlic dosa. If you feel like experimenting, you could even ask them to customise your own dosa. The snack items are the bhajjis, pakodas and bondas with more desserts on offer! If you are a fan of idlis and dosas, the options at iD would really impress you. The dosas are tasty and crispy and there are 10 different varieties. Remember the “99 Variety Dosa” shops in Bangalore? Well, they are popular for their Cheese Dosas and iD brings this popular dish to Chennai! Another popular one from Bangalore is the Mysore Masala Dosa served with three different chutneys and tasty sambhar. 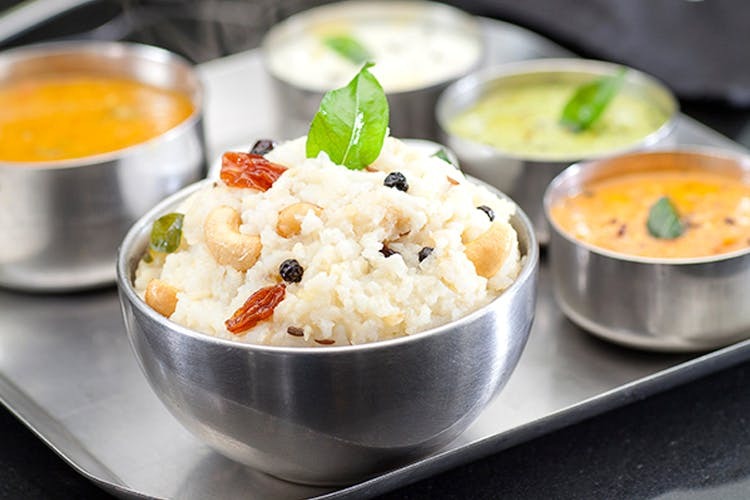 If you’re heading in for a lunch, the South Indian and Mini Meals are quite filling with the different poriyals and rice varieties. The snack items are the bhajjis, pakodas and bondas with more desserts on offer!You can wash down the food with the yummiest glass of buttermilk during this hot summer as well! The pricing might be considered as slightly overpriced, but the food ambience make it worth it. At iD, other than the food, the service is quite something else. Eager and prompt, the staff is always ready to help out once you walk through their doors. The décor and service really sets a new benchmark for a traditional South Indian restaurant and the next time you visit the beach, do visit iD! Don’t worry about parking, they’ve got valet too. We recommend trying the Ghee Pongal, Keerai Vada, Roasted Garlic Dosa and Filter Coffee.